Kana Nishino - Still love you · forums · community | osu! Video encoded by FruityEnLoops - Check out his Video/Audio Encoding & Editing queue here! FruityEnLoops for the video encoding~! Wafu for the Metadata check~! Last edited by Modem January 6, 2018 at 10:37:27 PM GMT , edited 93 times in total. From Fruity's Video / Audio Encoding & Editing Free Queue! If you have any complaints / questions just tell me. 00:26:785 (1) - this wiggle slider is unrankable...? It looks hard to player,,, 00:38:785 (1) - is, too. 00:52:847 (3,4) - I suggest stacking here, for thinking about flow with 00:53:597 (4,1) - , current pattern looks little bit uncomfortable for flow. 01:41:410 (2) - I think you should make jump here, you added jump at other parts which flows same music like this. for ex, 01:35:222 (2,3) - 01:38:035 (1,2) - ...etc. sasme problems at 01:50:222 (2,3) - , too. 02:58:285 (2,3) - minor issue, how about blanket for better visual? 02:20:035 (5,1,3) - this pattern looks little bit messy? this part has too many overlaps, it looks messy for me, you can avoid overlap in here. 03:00:535 (1) - players can read this sliderpath into wrong way, could you make it little bit easier to read? 00:56:035 (1) - Looking at all the kiais around this particular spot - this is pretty high of a jump and for the sake of consistency - maybe reduce it some? 02:18:535 (1,2,3) - adjust distance? 00:20:972 (8,9,1) - adjust distance? 03:00:535 (1) - Should this be upside down? 01:30:535 - maybe add a spinner here? 00:50:035 (5) - why did you mapped 00:50:222 - passively, while in parts like this 00:47:035 (5) - or this 00:44:035 (5) - you mapped them actively. 02:48:535 (1) - Because it's still the bridge of the song it would be better to stick the same visual spacing. Try 1.2x DS? 03:00:535 (1) - Upside down heart? 03:00:535 (1) - Can you get it so this isn't upside down? 01:11:410 (4,5) - Improve the flow? Good luck in the ranking process!!! 01:56:035 (5) - Add NC like others, this part has same beat with 01:47:035 (1,1) - ... Okay fixed~! 00:52:847 (3,4,1) - (Minor) maybe turn this slightly more towards the left for a bit better flow towards 00:53:222 (2) - Okay, fixed~! Last edited by Modem December 31, 2017 at 1:26:58 AM GMT , edited 1 times in total. 00:24:722 (2,3) - stack error Okay fixed~! 03:54:535 (1) - why not make this a triple Nice idea owo Fixed~! Last edited by Modem December 31, 2017 at 9:43:11 AM GMT , edited 1 times in total. 00:26:785 (1) - I can't say I'm a fan of these sliders. They don't really fit in with the atmosphere of the song and the red wiggles make them spin of crazily and unexpectedly at the end Okay fixed all of them~! 02:26:410 (2) - Flow is weird. Try this? 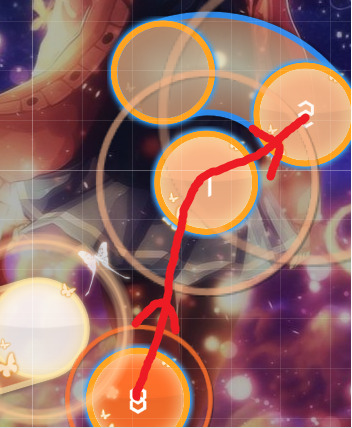 https://osu.ppy.sh/ss/9881124 It fits in with the structure of these sliders quite well 02:25:285 (3,4,1) - Fixed~! 00:57:347 (6,1) - Jump feels too big for a hard Fixed~! 01:45:347 (2) - Deleting this circle feels ideal imho. When you do a long slider you lose your sense of metronome a bit and can be a bit hard to recover it when exiting a long slider. Deleting the circle flows a lot more natural rhythmically Okay fixed~! 01:54:347 (8,1,2) - Flow here is really harsh, smal wide angels after big jumps are really hard to control and aim precisely https://snag.gy/BHexbR.jpg If you want to keep the jump then increasing the angle between 01:54:535 (1,2) would flow much better https://osu.ppy.sh/ss/9881013 Fixed~! 01:11:785 (5) - Try 2 circles here instead. There are 2 seperate vocals here and having these as circles would put more emphasis on the slider on the downbeat 01:12:535 (1) because the objects are different. Same for 02:29:785 (5) Fixed all of them~! 01:17:785 (4) - 2 circles would be good here as well as there are 2 distinct vocals on the head and the tail here where as there is only 1 vocal sound mapped with 01:17:035 (3) Fixed~! 01:38:035 (3,4,5,6) - The short sliders + spacing makes it extremely tricky to follow and keep track of rhythm. Try stacking like you did at 01:50:035 (3,4,5,6) it makes it much more natural. It reduces the amount of cursor movement and makes it easier on the player Fixed~! 01:08:410 (4,5,6) - This increased object density feels rather forced. I would suggest to either delete 01:08:597 (5) - or turn 01:08:410 (4) - into a slider Okay fixed~! 01:17:035 (1) - Delete NC Fixed~! 01:32:785 (1) - Delete? Flows a lot better to me to start at 01:33:535 (1) - Okay, Fixed~! 02:26:410 (4,5,6) and 03:29:410 (4,5,6) - Same as 01:08:410 (4,5,6) Fixed all of them~! 02:35:785 (4) - 2 circles would give great emphasis on the next slider. If you change this then it would be a good idea to change 01:17:785 (2) and 03:38:785 (4) Okay, fixed all of them~! 02:55:660 (3,4,5) - Flows better >< https://osu.ppy.sh/ss/9881365 Fixed~! 00:51:535 (1,2,3,4) - imho deleting all this and replacing it with a circle would be nice https://osu.ppy.sh/ss/9881410 . The small break before the kiai is a nice resting point and by removing all those objects it greatly emphasises the start of the downbeat. Same for 02:09:535 (1,2,3,4) and 03:14:035 (2,3) That's a nice idea owo Fixed all of them~! 01:32:785 (1) - delete Okay, fixed~! 02:35:785 (4) - Same suggestion as normal ~ Okay fixed~! Hey, the current metadata should be correct. If anyone tells you to use "Nishino Kana" instead, it's not correct. "Kana Nishino" is her preferred romanisation. Metadata confirmation by Wafu, thank you very much~!